11x14 Inch White Picture Frame - Elegant and stunning! 1. Versatile: Fits an 11x14 photo without mat or an 8x10 with mat. The easy-open tabs at the back let you load pictures quickly. 2. Protect your pictures. The glass front protects and preserves your photos, while the acid-free mat prevents wear and tear. 3. Looks sharp! Tired of traditional frames? This white frame will add an elegant accent to your home or office. 4. Built to last. This stylish frame is made of high-end MDF and is very durable. The frame comes with hanging hardware and is easy to mount. Don't just leave your photos on your cellphone! Order your Americanflat frame now and join thousands of other satisfied customers who LOVE Americanflat products. ELEGANT EUROPEAN DESIGN: 11x14 inch white picture frame made to display pictures 8x10 inches with the mat or 11x14 inches without the mat. Comes with easy to install hanging hardware. HIGHEST QUALITY MATERIAL: Ideal for photos sized 11x14 inches without the mat and 8x10 inches with the mat. Comes with built-in metal tabs that allow for easy access to load photos, cards and memories quickly and securely. ATTRACTIVE LOOK: White mat keeps photos looking great for years. Turn your posed portraits, artful prints and everyday shots into a spectacular display. 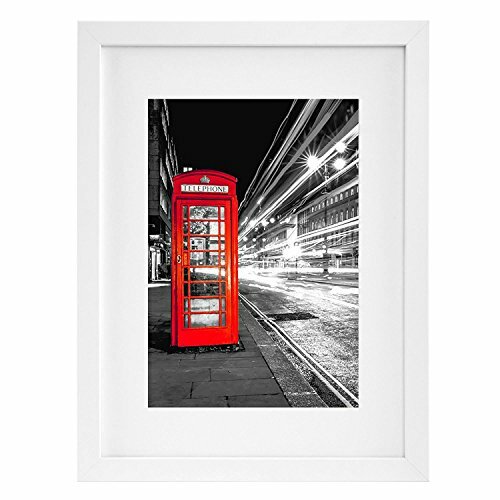 PERFECT FOR HOME OR OFFICE: White in color with sturdy glass front to protect and preserve your photos.